How Resistance Level is Found in a Stock? We often say that 'stock just went up once I sold mine' and as a net result we get frustrated in the stock market and end up saying that it is a Satta market. However, we have to understand the genesis and Science behind this kind of action which is related to emotional behaviour of human being. Early exit from a stock before it starts delivering returns is not a rare event. Prices may go down as soon as we buy a stock. Initially we remain calm, but if the stock price does not improve over a period of time, frustration starts building up. Longer the time period of holding below buying price and deeper the fall, higher is the frustration level. Finally when prices start improving after a long wait, we simply exit at breakeven level or at a very small profit. This is how resistance levels* of stocks are formed. As per investopedia the Resistance (resistance level) is a chart point or range that caps an increase in the level of a stock or index over a period of time. 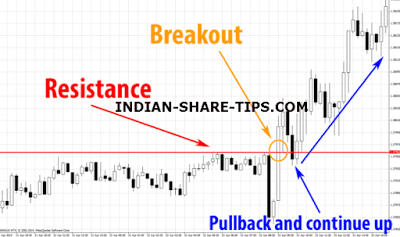 An area of resistance or resistance level indicates that the stock or index is finding it difficult to break through it, and may head lower in the near term. When we analyzed our investor data, we found that prices do increase very rapidly once this strong resistance is broken. It is very important to not only buy the good stock but also give it an opportunity to deliver good returns. Good stock picking combined by ability to sit on profits is formidable combination in creating wealth. *Resistance levels is a point that act like a price ceiling that price cannot break above. However if you do not want to get into any technical jargon than just straightaway jump into the market with our hot stock of the day and get profit by 11:30 AM every day.